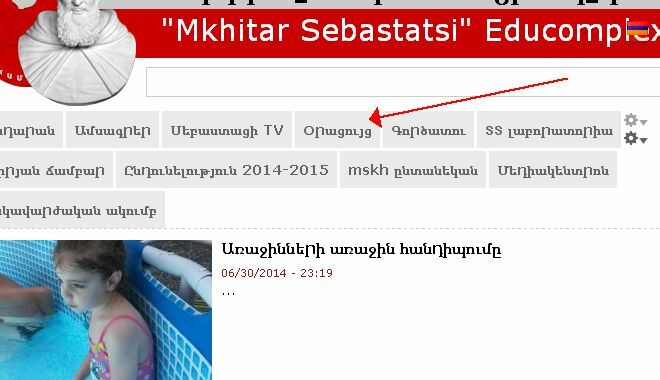 During the 25 years of its mobile and creative work “Mkhitar Sebastatsi” Educomplex has developed its educational calendar, which undergoes amendments every school year. Like an individual, family, society in a state and a church the Educomplex has habitual everyday educational working days and also annual, regular creative gatherings, reviews, camps, festivals and other educational projects which are as much important for the learners, their parents and teachers. These events organize and direct everyday work of author educational programs being realized at the Educomplex schools and college, become a chance and opportunity to summarize, review and estimate the results of educational work. Now there are two educational calendars on the Educomplex official website. The Educational Calendar of the 2013-2014 School Year organizes the final chords of the school year, “Educational Summer” for the learners of all ages, “Summer Garten” for pre-school children, educational-review camps in Yerevan, different regions of Armenia and Artsakh. The project of the Educational Calendar of the 2014-2015 School Year has also been published. · The 2014-2015 calendar has minuted the dates and events which unite the learners, employees and educators of the Educomplex in the given school year: the start and finish of the school year, on August 11 for the school headmasters and heads of offices, on August 18 for the educators, on August 28 for the learners. The calendar also mentions the beginning of the second term and the beginning of the lessons. The educational terms end with the public educational review “I Can”, educational camp and also with public educational winter and summer review-festivals. · The calendar shows that autumn, winter, spring and summer holidays given during the school year are educational ones. It provides a non-stop learning system. · Out of the law of RA and the Church Calendar of the Armenian Apostolic Church about holidays and remembrance days, we choose the ones which are related to or support the author educational program and give additional impulse and spirituality to the educational projects. · The calendar also comprises annual works related to working out, realizing and disseminating author educational programs defined by the state support contract signed with the Ministry of SE of RA. · Weekly, monthly periodic meetings, other annual project-review-creative gatherings, which are organized in have found their permanent place in the calendar, which are organized in the Educomplex or out of it: in the regions of Armenia, in Artsakh and Georgia. · Reminds the educators, learners and their parents about the oncoming work. · Shows the date of completing long term projects. · Makes it possible for the Educomplex partners, friends and others, who are interested, to take part in our educational work and festivals. The works and festivals defined by the educational calendar are not undertakings. Each of them is connected with the educational work performed by the Educomplex educators, learners of schools and pre-school children, and this work concerns the parents community and partners. It is included in the content of educational programs and subject courses and becomes the lesson theme for a definite period of time. It is organized as an open educational project; the organizer (coordinator) is the Educomplex school, club, educational Centre, project group. During the realization of educational projects at schools there can be changes in the terms of organizing lesson: place, time, duration and form. The content, which is defined by the calendar, is published in the subject courses beforehand. The work defined by the educational calendar is uniting: even if it concerns a definite sphere, for example, “Tigran Hayrapetyan Days: Social Studies Review” requires technological, designing, media technological, verbal work, use and development of foreign language skills. The Educomplex festiva -creative gathering presupposes educational trips and receiving guests, intellectual and sport games, other uniting educational activities. On the basis of the Educomplex educational calendar the Educomplex schools, juvenile clubs, junior classes of the educational program “Fun of Knowledge”, groups and individuals work out their own educational calendars, where they mention particular events and dates concerning their educational work. The creation of these educational calendars is also considered to be educational work which is done by groups of teachers and learners.